For a limited time only, you can buy an Apple iPhone from Verizon for only $10 a month. No, for that price you're not going to get the iPhone X, or any other recently released model. You'll have to make do with the Apple iPhone SE, the company's lowest price handset. With a 4-inch display, the iPhone SE looks exactly like the iPhone 5s, but is powered by the A9 chipset, which includes a dual-core CPU running at a clock speed of 1.84GHz. A 12MP camera adorns the back of the phone, and in front is a 1.2MP FaceTime camera. Verizon had been asking for 24 monthly payments of $14.58 for the 32GB iPhone SE, which has been reduced by 31% to $9.99 a month. You do have to add a new line to qualify for the deal. The 128GB model has been cut in price from 24 monthly payments of $18.78 to $14.99 a month, a 20% reduction. No trade-in is required and the phone is available in Gold, Silver, Space Gray and Rose Gold. For a limited time, Big Red is also asking for 24 monthly $10 payments to purchase the Moto Z2 Play. That is a 41% cut from the usual $17 a month price. This device carries a 5.5-inch AMOLED screen with a 1080 x 1920 resolution. It is powered by the Snapdragon 626 chipset, featuring an octa-core CPU running at 2.2 GHz. A 12MP (f/1.7 aperture) camera can be found on back, with a front-facing 5MP selfie snapper included. 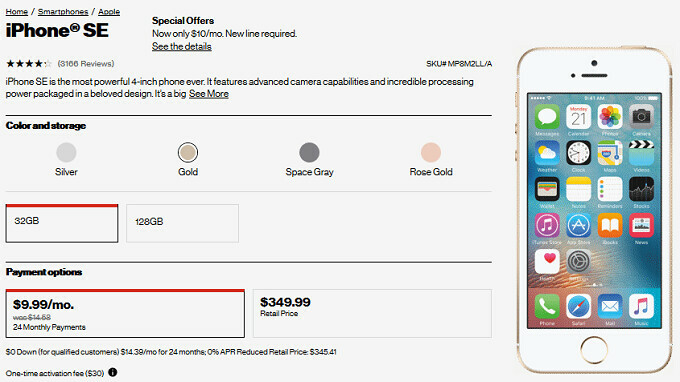 The phone, with 32GB of native storage, is offered in Gold and Gray. Again, a new line needs to be activated to qualify for the deal. Sequels to both models are rumored to appear this summer. So if price isn't your reason for picking up either one of these phones, you might want to wait for the Apple iPhone SE 2 or the Moto Z3 Play. Whats the point of even posting this if you need to buy a new line. For people that need a new line. Even still $10 a month for a smartphone that came out back in March 2016. Not worth it. What’s with the $20 line access fee Verizon charges? And, why would anyone go for that, unless you travel across the country a lot? I don’t get it. That's a pretty good price for a Z2 Play. I've found it to be an excellent phone and PDA (remember them? ), The camera is ok, not state of the art, but quite usable. It makes for a very serviceable eBook reader, when it's too much trouble to take my Kindle PaperWhite device. No regrets in having bought it.